My dog Laika’s pretty fussy about what she does & does not like — especially when it comes to clothing. She doesn’t mind wearing hoodies, in fact she comes running when I break out her beloved red one. She doesn’t mine capes or shirts either, but anything that covers her legs or head is a no go. I know it’s tempting to see your dog in a full pirate outfit (I’ve tried), but not all dogs like wearing elaborate Halloween costumes. 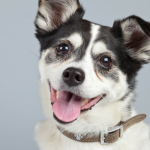 If your dog doesn’t isn’t a fan of wearing that pretty princess gown or prancing around in that full wizard’s robe don’t worry — there are some simpler options that still look festive. 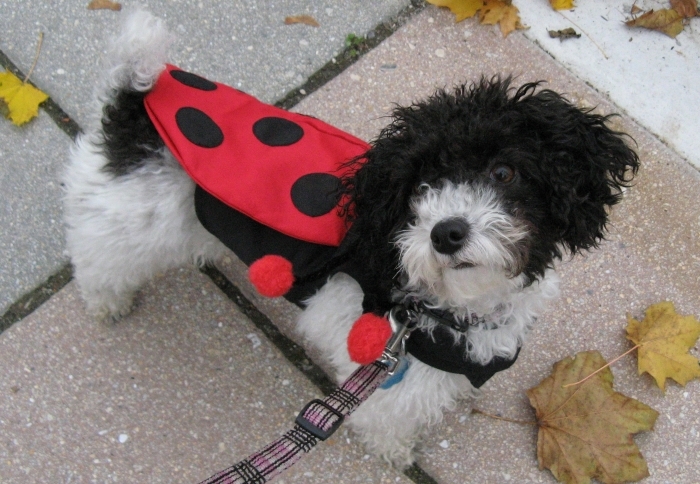 Here’s 8 easy ways to dress your dog for Halloween. 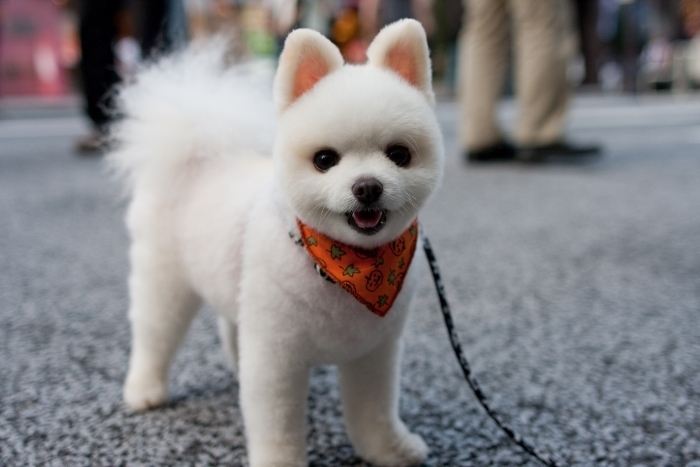 Bandanas are a simple way to dress up your dog, and if they’ve ever been to the groomer you might already have a few on hand. You can find plenty of Halloween themed bandanas at most pet stores or online — and if you’re a little crafty you can make one of your own. How cute, simple and festive is this? 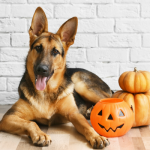 Some of us are a bit obsessed with dog collars and already have quite a collection — and there’s no better time than Halloween to show off some of our more decorative choices. 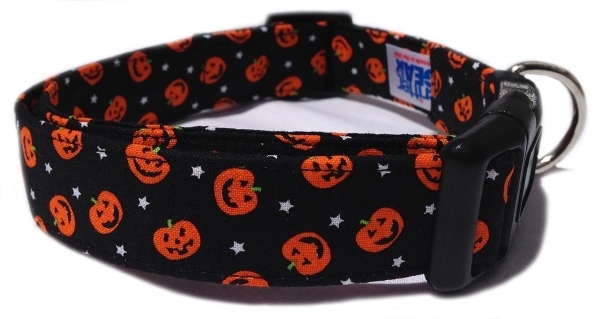 If you don’t have any Halloween themed collars there’s a ton to choose from — from simple pumpkin patterns to fancy ones with LED lights. 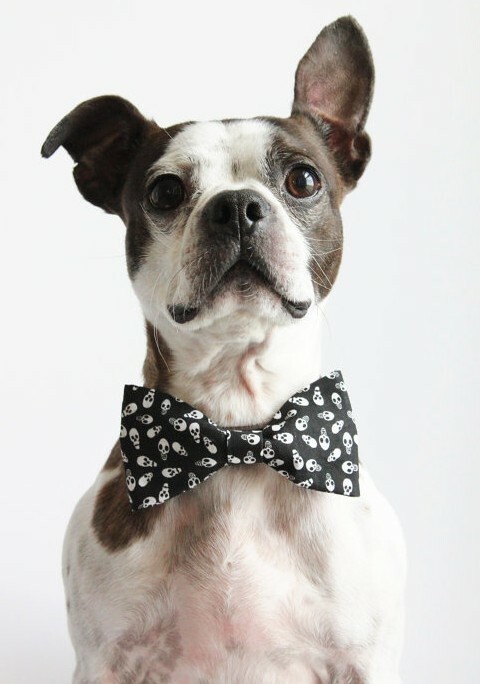 There’s a lot of super cute dog bowties available from Etsy and Amazon, or you can learn how to make your own. I can’t take credit for this brilliant idea, it comes from Beagles & Bargains. Onesies make excellent last minute dog costumes, and if you’ve ever been shopping for a baby you know how many options there are. They’re pretty non-invasive as far as costumes go since, and most dogs will probably appreciate that they leave their back legs bare. Check out how a few simple steps can turn a regular onesie into an awesome dog costume & how to determine the right size for your dog. Just like bandanas scarves are about as simple as it gets. And I don’t know what’s happened in the scarf world but have you seen how many different kinds to choose from these day? Just make sure if you’re using a long one you wrap it up so they don’t trip on the ends. 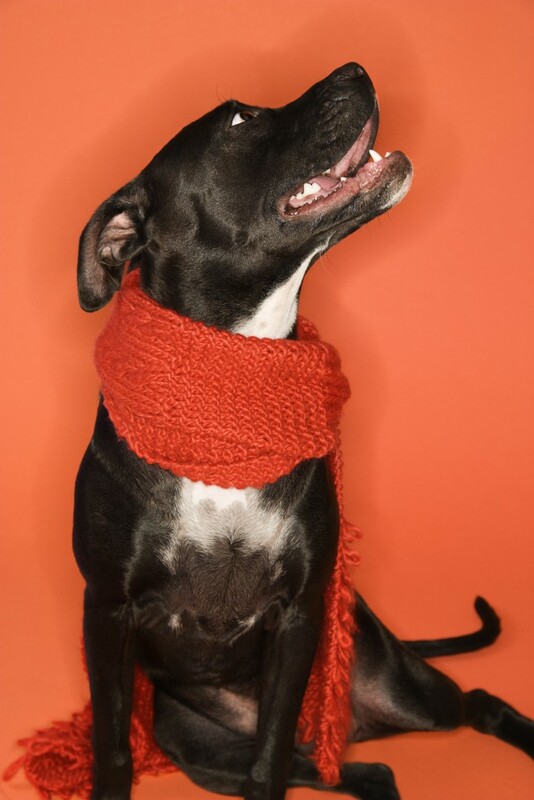 You could make your dog into a ski bunny or just pick some awesome bright colors for some extra flair. Or a simple orange scarf alone looks quite festive for Halloween, and if you’re shopping last minute you can probably find plenty at your local store. They make one simple costume, and most dogs don’t seem to mind wearing a t-shirt since they don’t restrict their movement in any way. 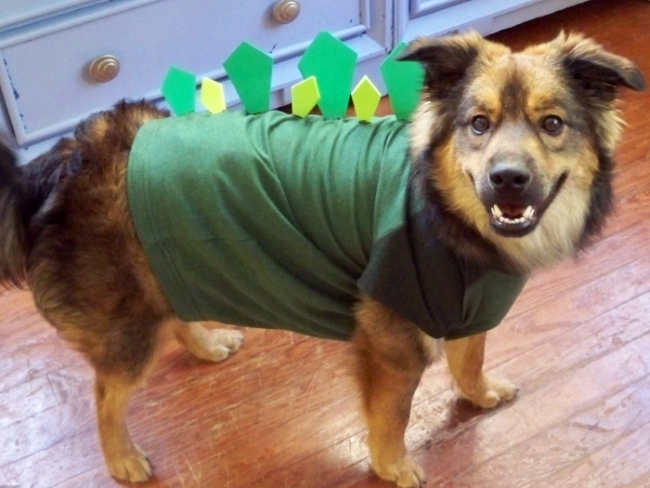 One of my favorite t shirt costumes is this adorable dinosaur – and the whole thing cost about $10 to make. You’ve probably seen those jockey dog costumes that have become quite popular over the past couple years; I think part of the reason they’re so popular is because rather than being a full out costume it’s just basically a toy on top of a harness – something fussy dog’s might not mind. But it doesn’t have to be a jockey – I think one of the cutest ideas I’ve seen is this simple ladybug. 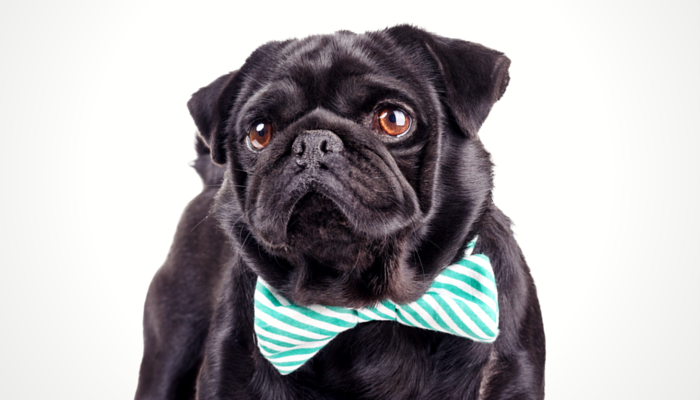 You could create it yourself by designing the patterned fabric & attaching it onto your dog’s harness. A tutu is such a simple way to dress up your dog – and they’re so easy to make if you’re feeling a little crafty. You can buy a doggie tutu in the pet costume section of your local store – or you can make your own in about 30 minutes for $10. 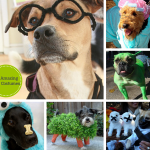 Does your dog mind wearing costumes, or do you have to keep it simple? Do you have a costume picked out for your dog this year? Wynston has a Halloween tie and shirt! (He won’t move in costumes, which is weird considering he models them for PetSmart…) and Khloee gets a tutu. But it lasts about 5 minutes before she scoots on the floor until it comes off. Those are great ideas! I might go with Halloween themed bandanas this year because we can’t afford costumes. Yeah last year I posted a bunch of “crazier” costumes, then quickly realized I don’t think I could have gotten Laika into any of them. And I’m pretty sure most dogs are like her – not big fans of things that restrict their mobility/go on their heads. 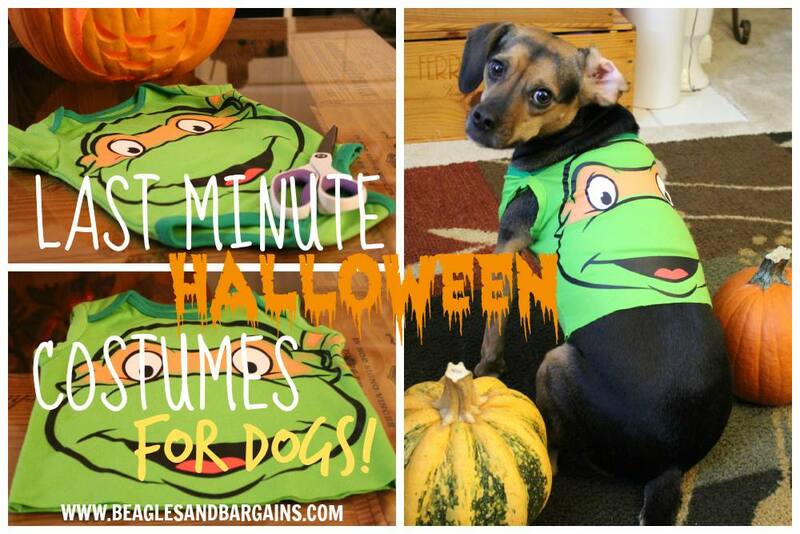 These are all great ideas and good for those pups that don’t really care for elaborate costumes. Sometimes I’ll dress Haley up for Halloween but I usually keep it simple so she doesn’t get stressed out. The scarf idea is really cute and simple! I love these easy ideas for dressing them up. My dogs are NOT fond of clothes (they are more like house elves in that respect.) 😉 Once for a blog hop I put a tie on Sampson and Butterfly wings on Delilah and almost peed my pants watching her bounce off the walls as she made her way down the hall. Typically now I use bandanas or collars. But sometimes I’m very tempted to try and ‘spruce’ them up. These ideas are very cool! It is always tempting, but like Delilah I usually end up watching Laika bounce around trying to get all the extra frills off. I love Halloween, but I think with pets that simple is best. 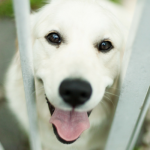 These are great ideas to show a little Halloween spirit, but not overwhelm the dogs!